A night to be remembered ! Following dinner at the Upper House guests were entertained by international star Elinor Jane Moran. Elinor tours with Andre Rieu. The party continued into the small hours with a disco. In December President Enid, together with Youth Services Committee members Bob and Kate, attended a school assembly at the William Amory School in Blythe Bridge. 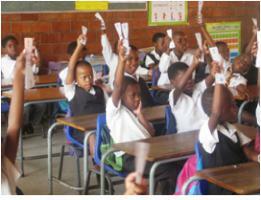 They had great pleasure in presenting over 220 books to the school. We are very proud of our new electric Santa sleigh. The only electric Santa sleigh in the U.K. The club's support to the village of Monze in Kenya continues. 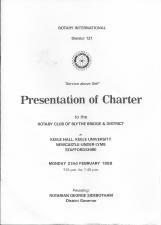 On the 24th November 2017 the club celebrated 30 years since its first inaugural meeting on the 12th November, 1987. On the 7th October the club held a Race night which raised over £1,000 for the Blood Bikes Charity and other Rotary Charities. 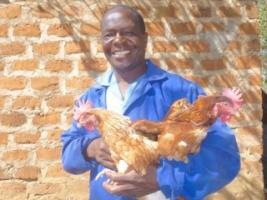 The village of Monze in Zambia now have a flock of 100 chickens. 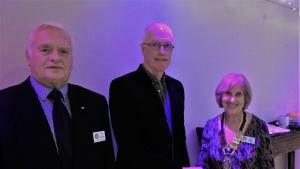 Start of the new Rotary year on the 1st July. President Sue wanted to Support Dementia Care in Staffordshire during her year as President. Cheques were presented to North Staffs Combined Healthcare NHS Trust and the charity 'Approach' both organisations help in supporting Dementia Care. On the 18th June club members and friends completed a sponsored cycle ride of the Manifold Valley in Derbyshire and raised over £300 in aid of End Polio. 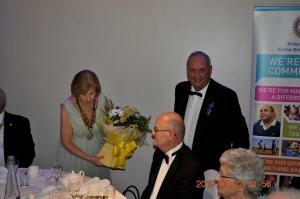 On Friday 17th February we celebrated our President's Sue year. A great evening with friends. A great time was had by all ! President Sue presenting cheques to local charities following the Christmas collections. (Boys Brigade 2nd North Staffs Company - £150, Boys Brigade 8th North Staffs Company - £150 Fulford Football Club - £200). Historic documents which have recently been located. 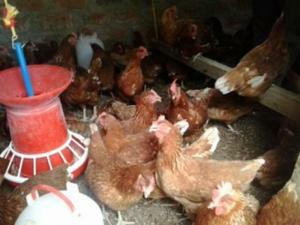 The club has funded this sustainable project funding the purchase of chickens and housing for the chickens which will allow the school to sell eggs in the local market. More new members joining the club. 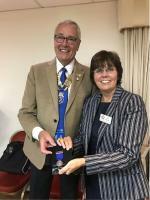 Past President Sue receiving her Past President award from current President Bruce. This joint venture between the Rotary Club of Blythe Bridge & District, Rotary Club Pinetown South Africa District, Bolton Daybreak Club (UK) and the Rotary Club of Salem Massachusetts USA District. The Rotary Clubs of Blythe Bridge,Stone, Wednesbury and Willenhall joined together to provide 300 Primary School Children. This is often the only meal each day. 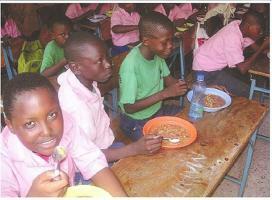 The cost of the meals is £575 a month and they now will be fed for the next four months.